The warning lights can be checked before the engine is started. This is the normal running position after the engine is started. 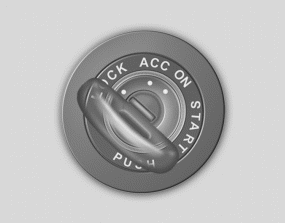 Do not leave the ignition switch ON if the engine is not running to prevent battery discharge. Never turn the ignition switch to LOCK or ACC while the vehicle is moving.This would result in loss of directional control and braking function, which could cause an accident. The anti-theft steering column lock is not a substitute for the parking brake. Before leaving the driver’s seat, always make sure the shift lever is engaged in P (Park) for the automatic transaxle, set the parking brake fully and shut the engine off. Unexpected and sudden vehicle movement may occur if these precautions are not taken.